The fossilized trackways made by an unknown, ancient sea creature. An international team of researchers is claiming to have discovered the world’s oldest footprints. Dating back a whopping 550 million years and found in a limestone bed in China, the prints were made by an unknown sea creature that was undoubtedly very strange. Fossils from the Ediacaran Period, sometimes called the Vendian Period, are exceptionally rare. The few animals that lived during this bygone era, between 635 million and 541 million years ago, were exclusively soft shelled, featuring no bones, teeth, or hard shells. Soft tissues aren’t prone to fossilization, since they degrade quickly after death, so scientists have only a shady conception of what some of our planet’s earliest animals were like. The Ediacaran was the period immediately before the Cambrian Explosion (541 million to 510 million years ago), a time when life underwent rapid diversification. But aside from bacteria and green algae, there were some animals of note from the Ediacaran Period. Some of Earth’s first burrowing creatures emerged during this time, as evidenced by the fossilized burrows themselves. As to what the creatures that dug these holes looked like, we can only guess. That said, paleontologists have found slither marks etched onto the surfaces of ancient rock, a hint that worm-like animals were slithering and burrowing so very long ago. Clearly, complex animals were starting to emerge during the Ediacaran Period, including animals with symmetrical body plans. 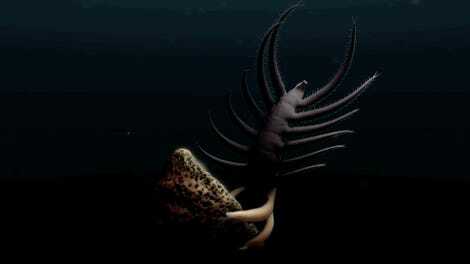 Known as bilaterian organisms, these animals featured a head, tail, back, and stomach. 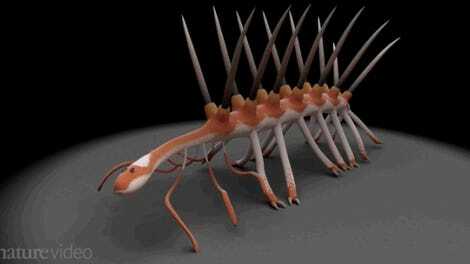 And for some, a symmetrical body also involved paired sets of appendages. New research published this week in Science Advances reveals the fossilized footprints left by one of these early creatures, and it’s considered the oldest known trackway made by a bilaterian creature with paired appendages. The researchers, led by Zhe Chen and Shuhai Xiao, say it’s highly likely the prints were produced by a bilaterian animal with paired appendages, but they know very little beyond that. The nature of the footprints suggests the creature was able to lift its body above the sediment at the bottom of the ocean. Also, the trackways appear to be connected to burrows, suggesting the presence of complex behaviors. This animal, it’s theorized, dug into sediments and microbial mats (layered sheets of microorganisms) in search of food and gulps of oxygen. Indeed, we won’t know for sure until more fossils are discovered. For now, we’ll just have to be content to imagine what life was like long before we humans emerged.